In this edition of 5 Minutes for Business, we examine how in order to remain competitive, businesses need to focus inwards and begin investing in and improving how they navigate mental health in their workplace. 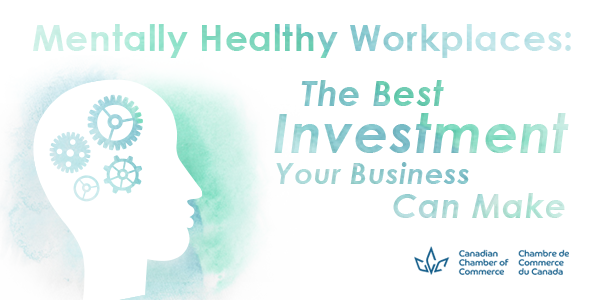 With most adults spending more of their waking hours at work and with one in five Canadians experiencing a mental health problem or illness, addressing the issue of mental health at work is vitally important for all people in Canada—especially employers. Mentally healthy workforces perform better and create opportunities that allow for inclusive growth for all sections of society. Our economy cannot afford to leave anyone behind, which is why we are moving from goal to action by implemented the Mental Health Commission of Canada’s National Standard of Canada for Psychological Health and Safety in the Workplace. You are receiving this email because you are a member of the Canadian Chamber of Commerce or because you signed up to receive information on policy updates from the Canadian Chamber of Commerce. Unsubscribe from this list.